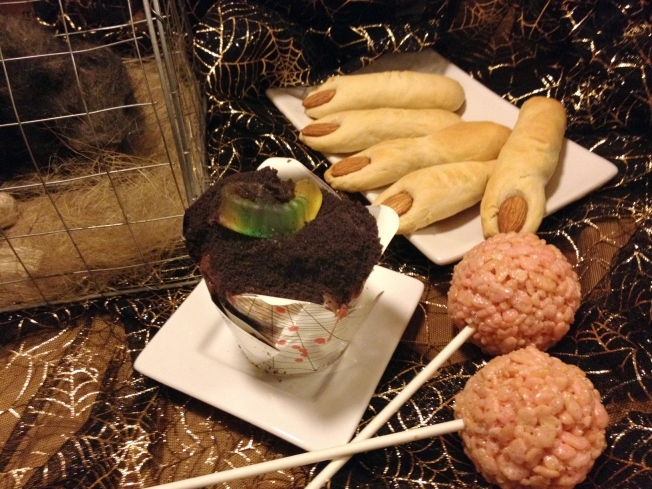 Try these six easy recipes from creepy crawler punch to earthworm cupcakes. Halloween is just around the corner and it’s always fun for kids of all ages. This week, I have great treats that are easy and fun to make with your little ones and are always a scary hit at any Halloween party. The first one, creepy crawler punch, is from my producer, Julie Pearl. It’s ghoulishly tasty with a fun little “melt away surprise”. I hope enjoy it and all the others. The day or night before serving, prepare the creepy crawler ice ring. Stir together corn syrup and water in medium saucepan over medium-high heat. Add cinnamon sticks, cloves and allspice; stir gently. Bring to a boil and immediately reduce heat to a simmer; simmer 10 minutes. Place mixture in the refrigerator, covered, until chilled. Remove cinnamon sticks and discard. Strain out cloves and discard. In a large punch bowl, combine syrup mixture with juices and ginger ale. Unmold creepy crawler ice ring and add to punch bowl. Arrange gummy worms in bottom of 5-cup ring mold; fill mold with sports drink. Freeze until solid, 8 hours or overnight. Preheat oven to 350 degrees F. Place liners inside cupcake pans. Cut 12 gummy worms in half and place a piece inside each of the cupcake liners. Separate cookies and scrape off filling. Place cookies into a food processor and process into crumbs. Prepare cake mix according to package directions. Pour batter into cupcake liners. Sprinkle about 1/2 teaspoon of ground cookies on top of each cupcake. Bake according to package directions. Remove from the oven and cool completely. Spread a thin layer of frosting on top of each cupcake. Firmly press most of a gummy worm into the frosting, allowing a part of the worm to be able to wiggle free. Sprinkle a generous amount of ground cookie over the frosting and gently press (I've found it's best to hold the cupcake over the bowl of cookie crumbs as you are spooning the mixture onto the cupcake...the extra just falls back into the bowl). Serve cupcakes on a platter with more gummy worms spread around. You'll only need half the can of dough for this recipe, so if you want to double it and make 12 hot dogs you can. Preheat the oven to 350 degrees F. Roll out dough and cut it in half crosswise. Place one half in a sealable bag and place in the refrigerator (you can use it to make witches fingers or double the recipe as mentioned above). Cut the half sheet into 6 equal parts, cutting crosswise. Flatten each piece on a lightly floured board with a rolling pin to about a 2" x 8" strip. Using a pizza cutter, cut each strip, lengthwise, into 6-7 narrow strips. Carefully wind each of strips around one hotdog, overlapping and crisscrossing as you do. Start at the top and then leave about a 1/2" gab after you've wrapped the top portion a few times. This little gap will be for the eyes of the mummy when you decorate it. Once you've wrapped all strips around the hotdog, place it on a baking sheet. Repeat the process with the remaining hotdogs. Bake mummies in the oven for about 12 minutes or until they are lightly brown. Remove from oven and allow to cool. Place about a tablespoon of mustard into a sealable plastic bag. Poke a tiny hole in one corner and then squeeze two little dots in the open section of the mummies to form eyes. Melt butter in a medium saucepan over medium high heat. Add marshmallows and stir until completely melted. Remove from heat and add orange extract and decors. Stir in cereal and mix until well coated. Allow mixture to cool slightly. Grease your hands with butter and form mixture into small balls (a little larger than a golf ball). Insert a lollipop stick into each ball and then squeeze it once more to help secure the stick. Melt the chocolate in a double boiler or in the microwave. Once fully melted, dip just about 1/3 of the top of each ball into the chocolate and then either roll it in the sprinkles or pour the sprinkles on top. Place the sticks in styrofoam so they stand upright while cooling and hardening. Once cooled, these can be wrapped in plastic with a little tie at the bottom. Combine corn syrup, butter, water, sugar and marshmallows over medium high heat. Stir until the mixture comes to a boil. Remove from heat and add orange extract and 2 tablespoons of red crystals decors. Carefully pour the hot mixture over the popcorn and stir to coat each kernel. As mixture cools slightly, grease hands with butter and quickly shape the coated popcorn into 16 balls before it cools. Sprinkle with the remaining 2 tablespoons of red cyrstal decors. These can be individually wrapped in plastic. Thanks again to Julie for sharing her punch recipe. Happy Halloween! If you have any questions or comments, please send me an email at wayne@waynesweekend.com or follow me on facebook.